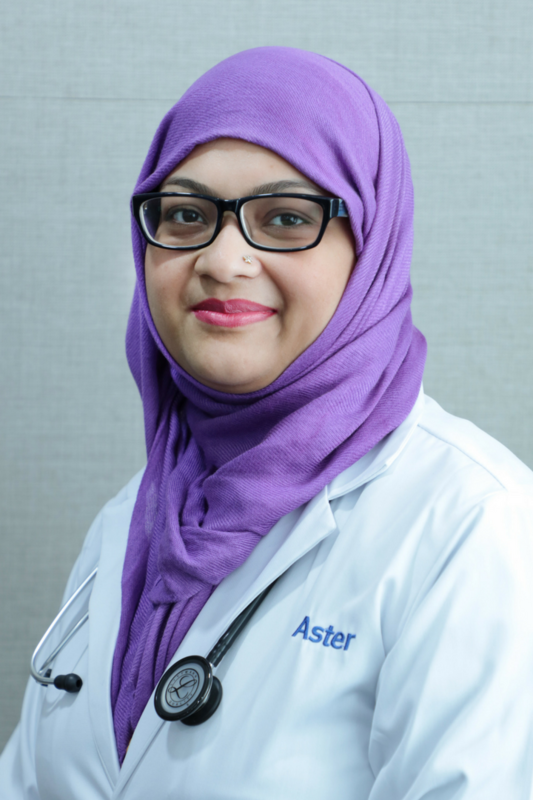 Dr. Anum Saif is a General Practitioner at Aster Clinic, Satwa (Saleem Polyclinic). She completed her MBBS from Dow University of Health and Sciences. Graduated Medical Officer with one-year house job experience in Jinnah Hospital, Karachi & voluntarily worked in various reputed hospitals across Pakistan and the UAE. Dr. Anum has a proven ability to manage the ICU patients to perform the emergency duties. A trusted patient-focused and experienced doctor with a good history of serving patients by successfully diagnosing, treating and also managing their illnesses and diseases. May 2012 – May 2013: Worked as a Medical Officer (MO) for House Job at Jinnah Hospital, Karachi in Department of Medical ICU, Derma ward, Anesthesia & General Surgery. Letter of Recommendation in General Surgery from Jinnah hospital, Karachi Pakistan. Letter of Recommendation in Derma from Jinnah hospital, Karachi Pakistan. Letter of Recommendation in Medical ICU from Jinnah hospital, Karachi Pakistan. Letter of Recommendation in Paeds oncology from Shaukat Khanum Memorial Hospital, Lahore Pakistan.